B12 shots help increase levels of B12, which is an essential vitamin that assists with metabolism and boosts energy. It also helps the body process carbs and create more red blood cells, reducing fatigue and promoting wellness. Our B12 shots are an excellent way to gain energy quickly and boost your overall health. We use methylcobalamin, the best version of vitamin B12, to ensure that our clients get the best-quality product available. 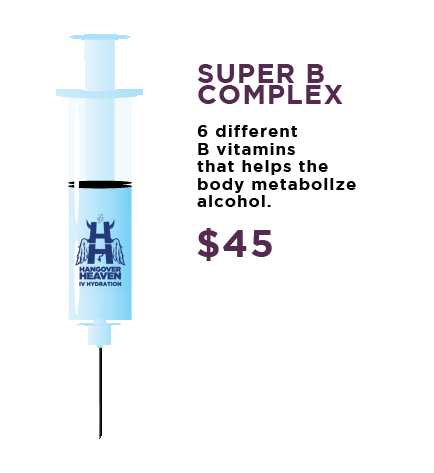 If you have a hangover of epic proportions that you feel will never go away, then the Eternity IV Hangover Cure is the choice for you. 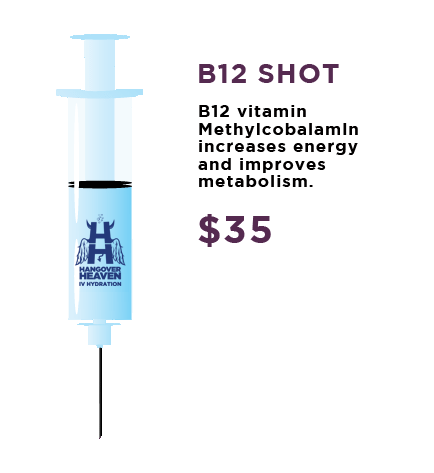 This is our “top shelf” IV hangover cure and takes approximately 35-45 minutes to complete. Don't let an epic hangover wreck your Vegas vacation! 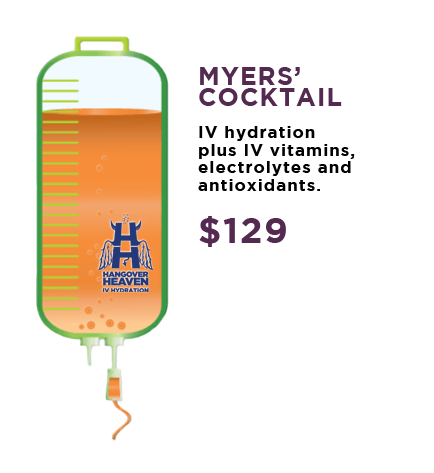 For parties of 5 - 10, Hangover Heaven IV Hydration is now offering a group discount. Reservations need to be made 24 hours in advance, and all guest must be in the treatment location within 15 minutes of the appointment in order to be treated. Grab your drinking buddies and book your group treatment now! Hangover Heaven Nightlife Prep is a physician and PhD formulated hangover prevention product designed to be taken before drinking to reduce hangover symptoms the next day. Free shipping the 48 Continental United States. We do not ship to any foreign country due to vitamin import laws. 4 doses total in this convenient bottle! Hangover Heaven Nightlife Prep is a physician and PhD formulated hangover prevention product designed to be taken before drinking to reduce hangover symptoms the next day. 30 doses total in this convenient bottle! Free shipping the 48 Continental United States. We do not ship to any foreign country due to vitamin import laws. Don't let an epic hangover wreck your group's Vegas vacation! 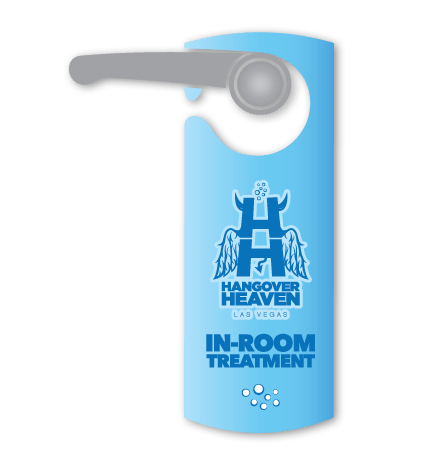 For parties of 5 - 10, Hangover Heaven IV Hydration is now offering a group discount. Reservations need to be made 24 hours in advance, and all guest must be in the treatment location within 15 minutes of the appointment in order to be treated. Grab your drinking buddies and book your group treatment now! The Hangover Heaven Super B Complex is a combination of six different B vitamins (B1, B3, B5, B6, B9, and B12), all of which are necessary for overall wellness. When combined with the Hangover Heaven antioxidants, clients can feel more more energized and refreshed for the day ahead. Do you have a mild hangover with nausea, headache and dizziness? If so, you should consider the Salvation IV Hangover Cure. This is our most popular IV hangover cure with clients and takes about 35-45 minutes to complete. If you have a major hangover giving you that "curl up and die" feeling, then the Rapture IV Hangover Cure is for you. This is our flagship IV hangover cure and takes approximately 35-45 minutes to complete. The Myers’ Cocktail includes IV hydration, vitamins, electrolytes and antioxidants. It is useful for many chronic medical conditions, dehydration, and preventing hangovers. We routinely administer IV antioxidants along with the IV hydration and vitamins to make sure your IV treatment is as effective as possible. READ OUR YELP REVIEWS HERE! The Hangover Heaven Nightlife Prep supplements were developed by Dr. Jason Burke – the world’s leading Hangover Specialist – to help support your natural defenses and replenish your body’s supply of vitamins and antioxidants. Free shipping in the continental USA and no tax outside Nevada. We do not ship to any foreign country due to vitamin import laws. Hangover Heaven Nightlife Prep is a physician and PhD formulated hangover prevention product designed to be taken before drinking to reduce hangover symptoms the next day. 14 doses total in this convenient bottle! Free shipping to the 48 Continental United States. We do not ship to any foreign country due to vitamin import laws.